Its been almost a year since I wore the most time-intensive garment I’ve ever sewed! I thought it was time to share it. Time: 9 months, not working on it every weekend, and mixing in smaller projects to keep my sanity. I did not keep track of hours. Materials: Ivory silk charmeuse and ivory silk chiffon, bemberg lining and interlining, all from The Fabric Place in Mt. Lebanon, Pittsburgh. Also some boning from Joanns. Hand-rolled double circle skirt hem length: 57 feet. I loved the materials used in this dress: silk chiffon over a silk charmeuse. The DOUBLE CIRCLE skirt was SO dreamy, I couldn’t stop lifting it and squealing as I swished all the fabric around me. I also loved the very dramatic back cowl. Determined that I could recreate this dress, I signed up for a Pattern and Fit class at Cut and Sew Studio. I found what I thought was a similar pattern and came to class with a muslin made. It was not nearly as close to the inspiration photo as I hoped, so with the help of Catherine Batcho, I drafted a new bodice pattern. 5 muslins later…. I had the fit just right. Fitting one of the muslins in nasty mauve fabric. One of the final fittings. Cut out and sewed the skirt! I ended up adding boning to the back “neckline (not sure what else to call it? )” to ensure it wouldn’t gape. It was very hard to anticipate fit issues like this before sewing the skirt to the bodice. DEAR LORD, pinned hem. This took SO LONG. I had 4 (I think?) follow-up sessions to help fit the bodice and hem the skirt. I have a bad habit of rushing through projects, and I tried my hardest to take my time and do the best job I could. 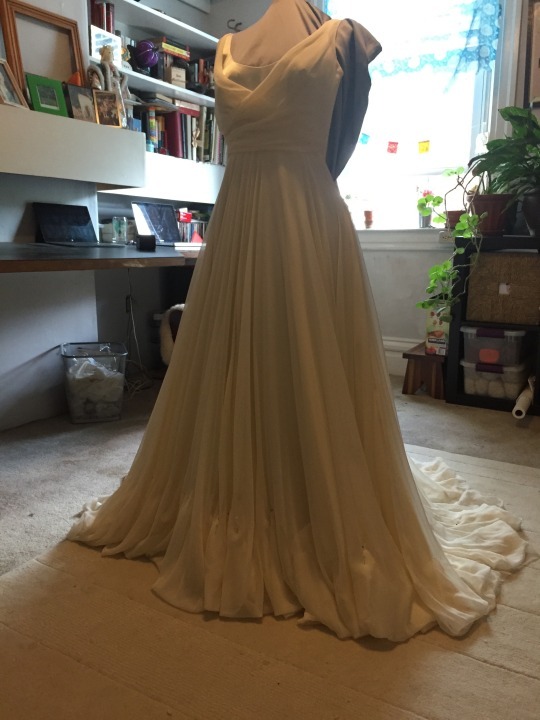 I am so so happy with how the dress turned out, and I am so happy I can say I made my wedding dress. Thank you so much to Catherine Batcho, I could not have possibly completed this project so wonderfully without your help. PHEW, who needs a drink? Wow, this came out amazing. Nice job. Thank you!!! If I did it again there are some things I’d change, but I often find myself daydreaming about how wonderful I felt in it that day.